For many children, the start of the school year at a brand new school can be scary and anxiety-filled. Kids worry about new teachers, forming friendships, getting taunted and bullied -- there's so much unknown. It can be terrifying for any child. But imagine if you were someone who looks and speaks like no other kid in your school. Ten years ago, Nathaniel Newman was born with Treacher-Collins Syndrome. "Nathaniel's birth was quite shocking," recalls his father, Russel Newman. "His face was swollen. He was born with no ears, no cheekbones, severe downward facing eyes, and little jawbone." After 54 surgeries, doctors at the Institute of Reconstructive Plastic Surgery (IRPS) at New York University Langone Medical Center have made extraordinary strides to repair Nathaniel's birth defect. Yet Nathaniel still doesn't resemble his classmates. How can they truly see all he has to offer -- his vivid imagination, his creativity, his sense of humor, his love for video games, his kindness and unbridled zest for life? "Numerous parents reach out expressing concern for their child entering school for the first time or entering a new classroom with unfamiliar peers and adults," says Dina Zuckerberg, Director of Family Programs at myFace.org, which funds surgeries and care at the Institute of Reconstructive Plastic Surgery, so all children can have the medical services they need. "How will they handle the stares, the teasing, and the bullying? Will they make friends? What can we do to help make the transition a smooth one?" 10-year-old Nathaniel has a good solution. A few weeks ago when Nathaniel moved with his family from New Jersey to Reno, Nevada and was about to enter the 5th grade, he and his family continued the yearly tradition of writing a start-of-the-school-year letter that was sent to his peers. "We include a picture of Nathaniel. It takes away some of the shock factor but more importantly affords parents an opportunity to discuss Nathaniel's differences," explains Russel Newman. 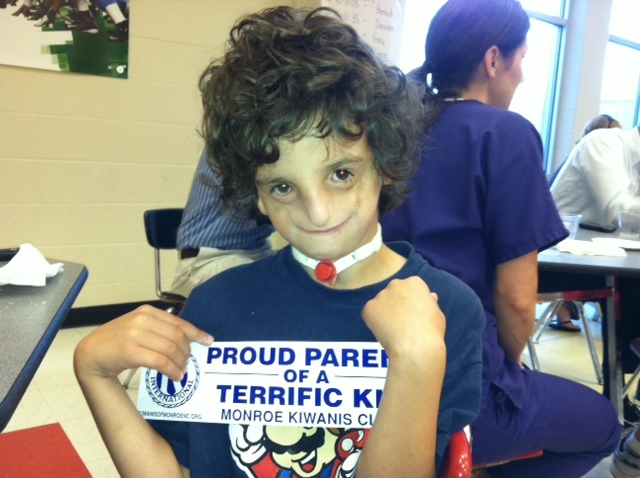 In honor of National Craniofacial Acceptance Month, click on this Parade story to read Nathaniel's letter to his classmates. And to borrow from Nathaniel's wisdom, "always choose to be kind."